Bytes and Wheels are Rueben collectors. Whenever they eat out and there is a Rueben sandwich on the menu – everything comes to a halt until they order one. And when it arrives, attention is focused on nothing but the Rueben and the whole Rueben. This Rueben Dip has the same effect. Nothing can interrupt the inhalation. With my tastebuds geared for smooth and sweet and chocolate – the Rueben sandwich thing escapes me. But I like this dip – on the creamy side with a bit of meat and a nice tang. Serve with miniature rye toast for the whole Rueben experience. It’s also good with triscuit crackers or a flatbread cracker – something with very little salt and mild flavor that is not competitive with the sauerkraut. 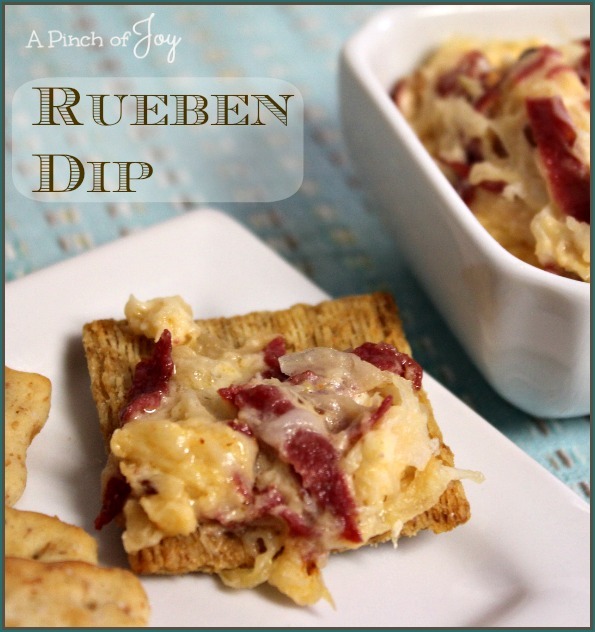 A creamy, tangy dip that tastes just like it's brother, the Rueben Sandwich! Serve with mild flavored crackers or rye toast crisps. Put 1 cup sauerkraut into colander to drain, press lightly once or twice. In large mixing bowl, mix cream cheese and Thousand Island dressing together. Chop deli sliced corned beef into even pieces. Add drained sauerkraut, corned beef and 1 cup of the Swiss cheese to cream cheese mixture and blend well. Spray 8x8 baking pan or a 9 inch diameter pie plate with cooking spray and turn mixture into pan. Sprinkle remaining ½ cup Swiss cheese on top of the dip. Bake until melted and beginning to bubble, about 20 minutes. Serve hot with rye bread, or mild flavored crackers, like triscuits, pretzel flips or flatbread. I’m so glad you stopped by today! Follow A Pinch of Joy using the icons on the teal bar at the top of the page so you don’t miss a thing! I’d love to have your company on this venture!! Share: if you found this helpful or inspiring please click one of the sharing buttons below! Your support of A Pinch of Joy is appreciated!